RAILROAD.NET • View topic - How many F40s and where do they most often run? How many F40s and where do they most often run? I should have an opportunity soon to visit Boston. I would like to see the Mattapan Trolley operation. as my primary target. But that is a pretty small operation. So what else to do with some time? I know almost nothing about MBTA. Roughly how many F40 versions do they operate and are they predictable in anyway as to where they run on a given day? I know MBTA also has some rebuilds that were made the mold of the MARC GP40s, but the lacked the truly neat cab that MARC's had. Same question how many and where would I find them? Beyond that I know MBTA got some modern things, but don't know how many or where they run? Does any of the power have cab signal/PTC/weight restrictions that keep them on certain lines? Any line that have weekday only operations? EDIT added the following: Any lines of MBTA more scenic or interesting that the others. And what route does the Amtrak F40 cab cars operate on? I would guess they share service with MBTA on part of the line???? Many thanks on getting me up to speed. Re: How many F40s and where do they most often run? 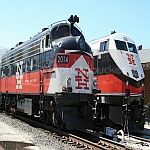 There are approximately 25 of the F40PH-2Cs ("stretch" F40s) in active service when accounting for those out for rebuild or in the shop for inspection or work. All the regular F40PHs are mothballed or ready to go out for bid as scrap. There's maybe a couple more South Side than North Side, but it is a fairly even balance. The former Amtrak F40s doing 'cabbage' service are on the Downeaster, which operates from North Station (specifically for MBTA territory, it utilizes the Lowell Line between North Station and Wilmington and Haverhill Line between Ballardvale and Haverhill). Sometimes the Downeasters run with an engine on both ends, but chances are good you'd see a cabbage on the Boston-end of the train (they lead inbound and are trailing when going outbound to Maine). When did the last classic "screamers" run? train2 wrote: EDIT added the following: Any lines of MBTA more scenic or interesting that the others. For rail, I'd say that none of the commuter lines is hugely scenic, but the Rockport commuter line does have a few nice water views along the way. For trolleys, I'd suggest riding the D/Riverside line, built on a onetime Boston & Albany branch that has some woodsy stretches west of Reservoir station that evoke an old suburban trolley line. You could also get off at Reservoir on the way back, walk around the corner, and continue inbound on the C/Cleveland Circle line that features median strip running along Beacon street through a nice part of Brookline. The South Shore Line (Red) has views of the bay on the Neponset bridge and of course, the skyline on the Longfellow Bridge. Last edited by CRail on Wed Nov 14, 2018 9:39 pm, edited 1 time in total. R36 Combine Coach wrote: When did the last classic "screamers" run? If I remember correctly, the last one went out of service during the bad winter of 2015. Someone here might have more exact information. Also, I think it's buried somewhere in the Retirements and Disposition of CR Equipment. I'll try to find it when I'm not at work later. The last one, 1013, was retired in June or July of 2015. June/July 2015 was when the 1013 last ran for the MBTA. It was leased to the Grafton and Upton later that year for their Hopedale Polar Express train and subsequently returned. So, if you count that lease period, 1013 ran until December 2015. If you didn't have time to go all the way to Rockport (note also that the Rockport terminus is a bit of a hike from the town) you could go as far as Beverly (Depot) you still get some good water views and Beverly is a nice town to walk around and has lots of good places to eat. Ditto for Gloucester, although Beverly has the advantage of 2x the train service to/from North Station. As Tom suggests take the D out to Riverside then come back to Reservoir and take the C into town. The Northern end of the Green line from North Station to Lechmere with the viaduct and bridge over the Charles River. The Green Line E train to Heath St which is the last section of street running left in Boston. The 2 vintage trolleys on display in Boylston St. station, also that section from there to Park st. the oldest subway in North America built in 1897. Wasn't the Lechmere viaduct removed? "That sapling that once grew just south of Wassaic may be long gone, and the Harlem Line’s appearance may have changed over the years, but for decades to come, I can count on it continuing to provide me with funny recollections"
NaugyRR wrote: Wasn't the Lechmere viaduct removed? Nope, it's very much still there and in use. You might be thinking of the Causeway St. El that led from North Station to Science Park. That has been replaced by subway and a new portal just as the line approaches the river, but then it continues across on the viaduct, which will continue to be true once the Somerville extension is built. That makes Science Park a rare elevated station (though built 1955 as an infill afterthought). Yep, Science Park and Charles/MGH are the only El stations left in the system. As for scenic T lines? I second the recommendation of the D and the C branches. D is the closest thing to an interurban that you'll find this side of the Norristown High Speed Line, and I will always posit that there is no American transit experience that will ever be anywhere near as cozy as riding a quiet C train on a winter night. On the commuter rail side of things, the Rockport line is about as good as it gets, between all the coastal running through places like Salem and Manchester By The Sea and that amazing little terminal right in downtown Rockport. A close second, though, in my eyes, is the Fitchburg line, which gets you a bunch of cute town centers with Belmont, Waverley, Waltham, Concord, West Concord, South Acton, Ayer, and Shirley, as well as some great views of the Charles in Waltham, Walden Pond, Lincoln, and the more rugged terrain once you get past Shirley and head into the hills. On the south side, the only line that even comes close to Rockport and Fitchburg would be the Greenbush line, which gets you all the elevated views of Dorchester and the Neponset of the other Old Colony lines while hitting pretty much every adorable town center between Braintree and Scituate.